Tuesdays with Dorie has been going strong for two years now! I’ve been part of the group since November 4, 2008 (Rugelach!). I haven’t made every weekly recipe since I joined, but I’ve made a lot and and I’ve also significantly increased my baking and cooking since joining TWD and starting my blog. Without a doubt, I cooked and baked more in 2009 than in any other year of my life. I plan to keep going strong in 2010! To celebrate the second anniversary of the group, this week features two recipes: Tarte Tatin and Cocoa-Buttermilk Birthday Cake. 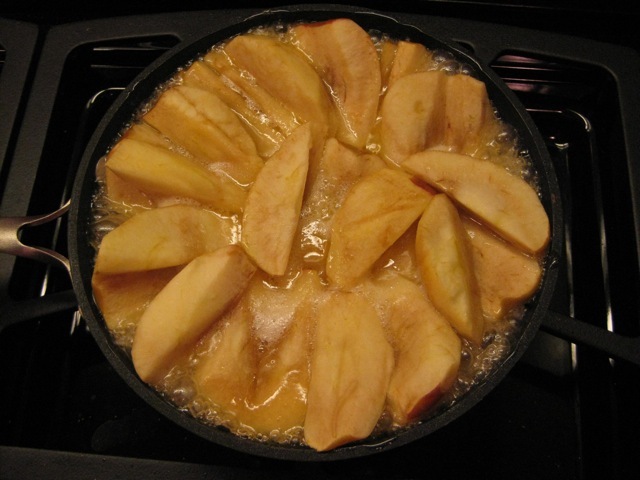 I made the Tarte Tatin, but others will be posting about the cake, and I’m sure some members made both recipes. Tarte Tatin is made by cooking apples in a pan with butter and sugar, topping it with a crust (a pie crust, tart crust, or puff pastry), baking it in the oven, and then flipping it over so that the crust is on the bottom. 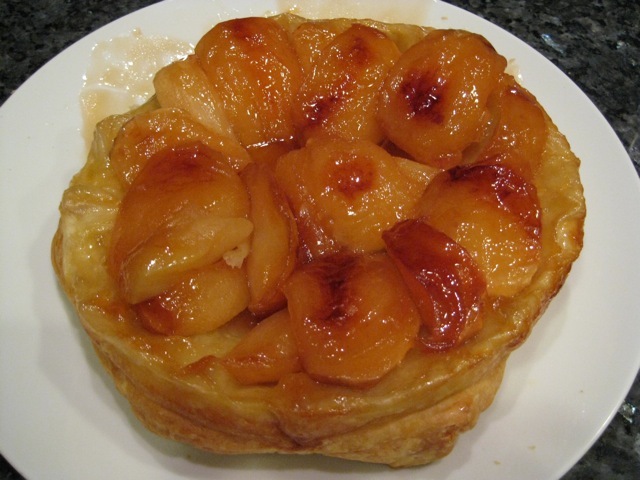 Tarte Tatin is a French dessert, and the only other time I’ve eaten it is when I was in France visiting friends. I have fond memories of that Tarte Tatin…probably because I got to sit and chat and drink wine until the dessert magically appeared on the table! What I did: I cut the recipe in half and made it in an oven proof nonstick pan. I used Gala apples. I went back and forth many times on what type of crust to use and ended up with frozen puff pastry. How it went: It took a long time for the butter and sugar to reach a dark caramel color. I didn’t time it exactly, but it was about 40 minutes (the recipe said 15)! My pan wasn’t very deep and the butter, sugar, and juices from the apples were bubbling a lot, so I had to keep the heat fairly low to keep it from bubbling over. Eventually it darkened enough and was ready to be covered with the crust and go into the oven. When it came out, it was puffed and beautiful! And then I had to flip it over onto a plate. Flipping hot things is not one of my strong points. I was hemming and hawing, and my husband said “Just do it! Commit!” And it worked pretty well! Just a small amount of caramel ended up on the counter. How it tasted: We cut into it after it had been out of the oven for about 30 minutes. The apples were soft and warm and the puff pastry was crispy; a delicious dessert to enjoy on a cold winter night (and I’m talking single digits!). My husband really liked the warm-out-of-the-oven factor and said he’d eat it again (he has a bad cold so he had less to say than usual). I liked the combination of flavors and textures. I will say that it was really really buttery. Would I make this again? : Maybe. It was good, but since it takes a bit of time to make it and can’t be made very far ahead, it’s not the most convenient dessert for many situations. I think this would be easier to make in a larger pan, which I could do if I was making the full recipe. You can find the recipe on page 312 of Baking: From My Home to Yours, or here on NPR’s website. Jill – thanks so much for your non-stick advice. I used it and it worked perfectly – only 2 apples stuck! I think so much easier than a cast iron! And I am trying the puff pastry next time – yours looks HUGE! I used tart dough – ok, but rather “heavy” – I love the light look of yours! Wow! Your puff pastry looks wonderful-and mighty tasty post flip! My tart wasn’t attractive at all(luckily it tasted great! )-I am so envious of yours!!!! I made the tarte too. I used puff pastry as well. Your wee tarte looks lovely. Gorgeous on that pastry…can definitely say you have the pastry knack of getting that to turn out perfectly. We loved this one, I would make it again, but then the guys can eat it all in one sitting, so not sure how it would be if it hung around for a bit. Happy New Year! Hahah I’m glad your husband gave you that push you needed to flip it over! It looks delicious! I love the just do it, commit! Looks great. I’m sorry to have missed the 2nd anniversary recipes. 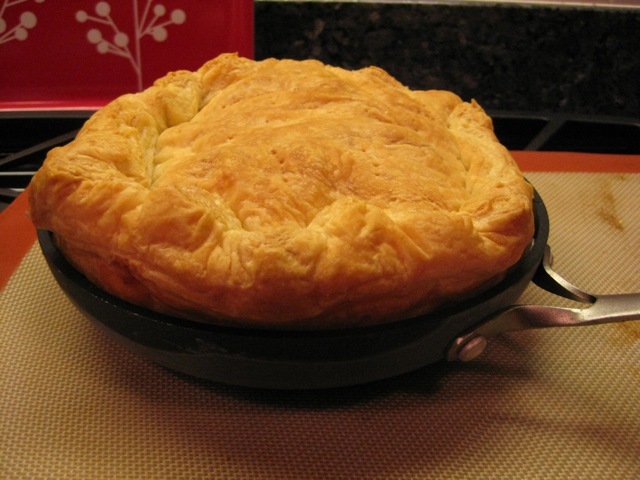 Wow–great puff on the pastry! I think I rolled mine too thin. I was a bit nervous about the flipping too, especially with an audience, but it was fine and no sticking in the cast-iron pan. I think that your tart looks great, and your pastry puffed up so well! Your tarte looks so good ! !In an other recipe book they made the caramel before adding the apples I think maybe it’s faster ! Your tarte looks beautiful..that’s how I wanted mine to turn out! I loved the buttery apple flavor! I loved this, both warm out of the oven and cold the next day. Yours looks pretty to me – and glad your hubby liked it. The caramel did take ages though – I thought it was never going to turn. Wow, it’s gorgeous! It was pretty easy if your pan is a little larger (though I might reduce the butter a little bit next time…I had some dribble over on the stove). I needed encouragement to flip mine too! Your tarte looks great! And you can make it ahead. It tastes wonderful the next day. Your tarte looks wonderful! I really wanted to make this one but I didn’t have the right size pan so I had to go with the cake (which I really liked!). A lot of the TWD bakers made the tarte and most have said it was great so I’m hoping to get to it soon! simply gorgeous! i love your puffy, appley dessert. nice work! I love your husbands’ encouragement – just do it! Commit! I would have whacked David with the frying pan, because whenever I’m unsure about something it generally doesn’t work out. But you had great success with it – and I can’t believe how puffy the pastry got! How fun that you’ve had tarte tatin in France! Yours turned out beautiful, so nice and puffy. I made my boyfriend stand by for moral support as I flipped mine. We started TWD the same week, I fondly remember the rugelach. Your tarte looks great!! Congrats on a successful flip!! 🙂 I loved this dessert so much, though my apples never fully carmelized, I thought it was delicious! Mine took a ridiculous amount of time as well. The only reason that I can think of is the cast iron makes it harder to turn that caramel-y color? Don’t quote me on that! But your husband sounds like my fiance, except mine nudged me out of the way and took charge of the ‘flipping really hot bubbly masses of oozy caramel’ but he didn’t burn himself, which is a good thing… because I’m certain I would have burned myself. Beautiful puff on the pastry. Next time I use the puff. Hey, Wait a minute. Why isn’t yours burned like thes rest of us. Seems like we burned it or didn’t get it dark enough. But yours is perfect. Nice job.